Garmin Circular 7 Pin Bare Wire Power/Data Cable (010-10083-00) €27.00 - buy online at mysatnav.ie - Ireland's leading GPS & Sat Nav store. 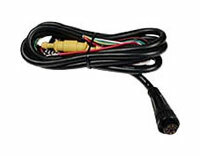 This power and data cable has bare wires at the end so you can hard wire your GPS directly to a DC power source or some other electronic device. You can then send speed and position data to devices such as a chartplotter, computer, auto pilot, radar, etc.